WhatsApp is a paramount platform for communicating. It gives users a chance to send messages, photos, and other valuable data. Sometimes, we may delete or lose some WhatsApp data by accident, so it is wise to save important audio messages, photos and videos on your computer for backup. 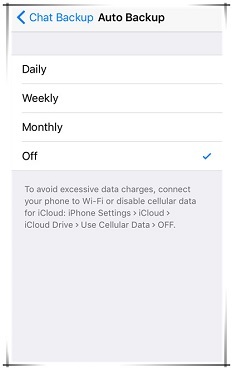 This article, therefore, explains how you can save your WhatsApp media files on your iPhone for later use. All the three ways work for iPhone running iOS 7/8/9/10/11, even the latest software iOS 12. To save your WhatsApp media files, you just need to follow these simple steps. Step 1: Navigate to the WhatsApp application and launch it. Step 2: After opening it tap the icon on the bottom right corner of your iPhone and click the "Settings" option. Step 3: After opening the settings, click on "Chats" to select the media that you want to save. Step 4: Then tap "Save incoming media" to make sure that all the incoming images and videos that you receive are automatically saved in your WhatsApp folder. 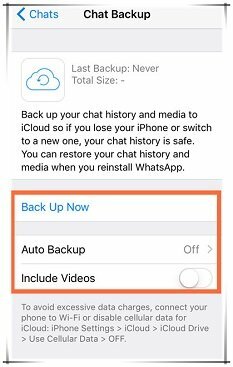 You can prevent the risk of losing your WhatsApp media files by enabling auto backup through iCloud. To do that, you need to follow these three simple steps. 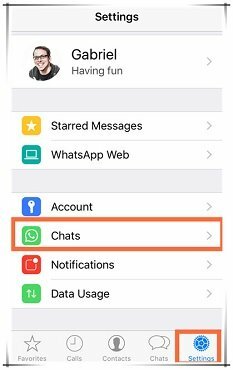 Step 1: Locate WhatsApp application, open it and then tap on "Setting" option. Step 2: When you open the settings, go to the "Chat" option and click to open it. 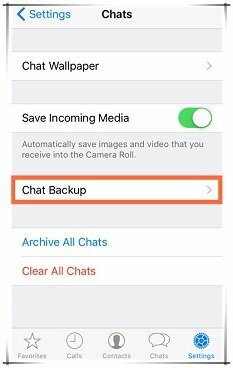 Then tap on the "Chat Backup" option. Step 3: Select iCloud as your backup account and then choose the "Back Up Now" option. This selection will instantly backup your WhatsApp photos and messages. Step 4: Turn on the automatic backup by choosing the "Auto Backup" option. Then select the schedule for your backup. The schedule could be daily, weekly, or monthly. Your messages and media will also be backed up to your iCloud and you can restore them when you reinstall WhatsApp. It is vital to save WhatsApp attachments from iPhone to computer and you can also make it by a data extraction tool. Though varieties of applications offer this function, none matches the service provided by iMyFone Port iPhone Data Exporter. With credible features, the program can do more than you expected. Besides WhatsApp, it extracts voice memos, notes, photos and more, altogether 18 types of data from your iPhone. 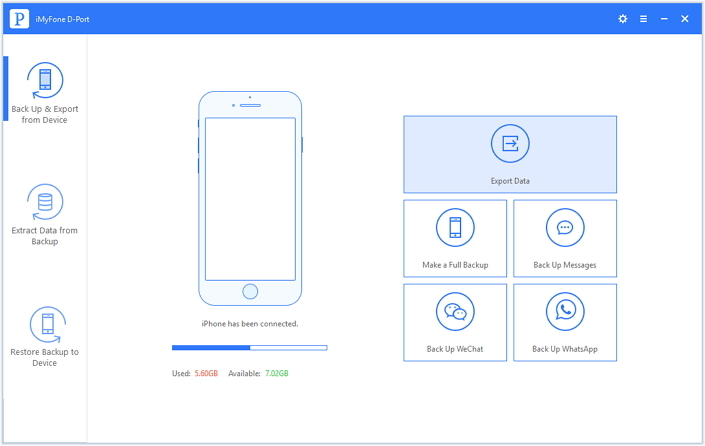 It can also be used to backup your iOS device completely or selectively, for example, you can backup your contacts messages, WhatsApp data, WeChat data separately. It works efficiently with almost all versions of iPhone including iPhone 8 and iPhone X, iPad, and iPod touch. The program can also extracts data from iTunes/iCloud backup. Its pro version iTransor can do more. For example, restore selectively from iTunes or iCloud backup. 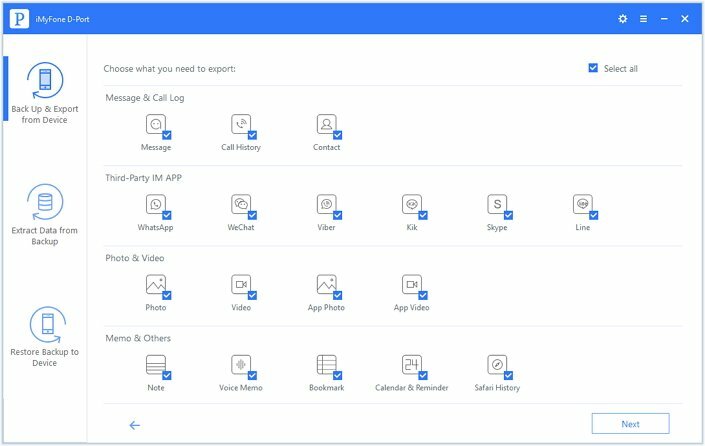 Here are step-by-step guide on how to save WhatsApp voice messages, text messages, and attached photos/videos from iPhone to computer using iMyFone D-Port (compatible with all iOS versions including iOS 12). Launch the iMyFone program on your computer and then select the "Back Up & Export from Device" option on the left panel. Connect your device to the computer. Then click "Export Data" to proceed. Select the WhatsApp as the file types you want to scan. 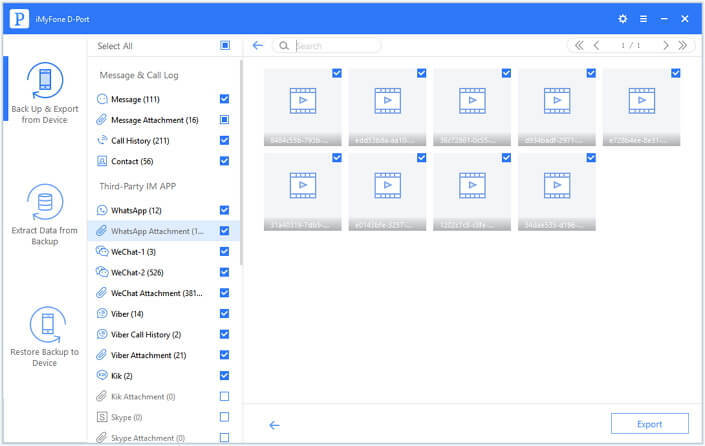 You can select all the file types of course. After you click Next, the program will start to scan your device. Once the scanning is finished, all the WhatsApp data will be displayed. Preview and select media files that you want to save. Then click on "Export" and choose a folder on your computer to save the exported files. 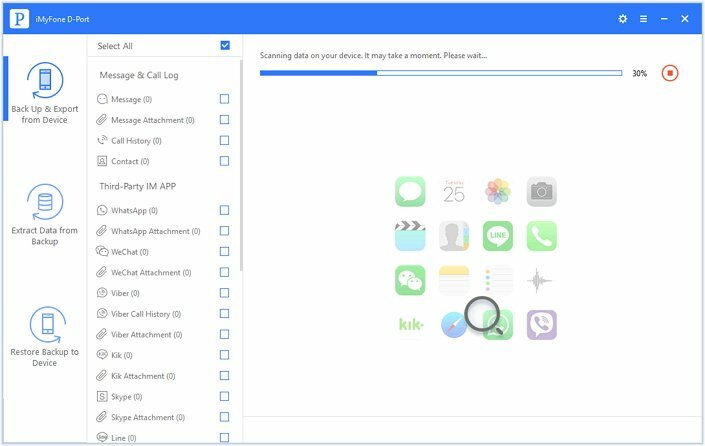 With iMyFone Port iPhone Data Extractor (iOS 12 supported), you can always save your WhatsApp and other data on your iPhone, iPad or iPod touch to your PC/Mac with the above easy steps. Just download its free trial version to have a try!